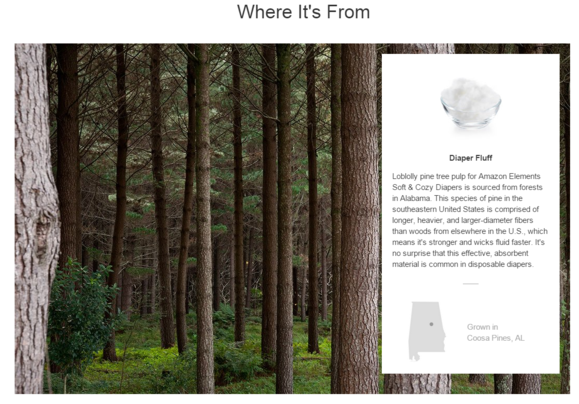 Hoping to add a boutique feel to Elements, Amazon says the new brand will offer an “unprecedented level of information” such as where items were made, why each ingredient was included, and so on. The impact on you at home: If you’re already a Prime subscriber and a parent of a baby or toddler, Amazon is offering yet another reason to shop online. 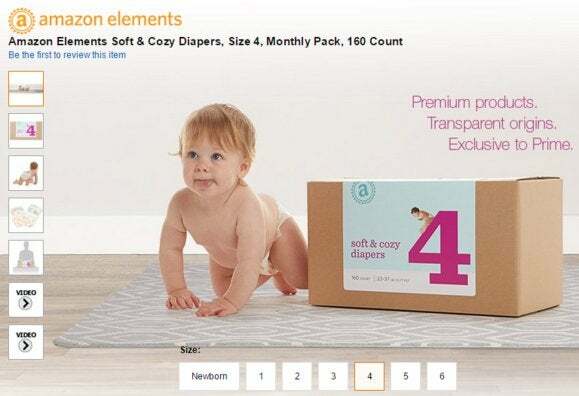 Amazon Elements could also push more Prime members to try out the Amazon Mom add-on since Mom members get the cheapest price possible for Elements diapers. At this writing a box of 160 size 4 diapers will cost Amazon Mom members $36 ($0.22 per diaper), where as regular Prime members can get a subscription price of $42.74 ($0.27 per diaper), or a one-time purchase at $45 ($0.28 per unit). Amazon’s product information for the Elements line is sure to appeal to parents. For a company closely associated with tech products like the Kindle e-reader and Fire tablets, diapers may seem like a strange choice for a new Amazon-branded product. Cheap prices, another hallmark of Amazon’s brand, doesn’t appear to be motivating the new diaper lineup either. Elements diapers do undercut Huggies and Pampers at Amazon, but not the products at other retailers. Finance site Kiplinger reported in August that Target was actually cheaper than its online rival when it came to diapers. Elements does nothing to change that fact—at least not yet. To understand Amazon’s desire for selling nappies we have to look back to the retailer’s 2010 purchase of Quidsi, the company behind Diapers.com. As reported by Businessweek, Diapers.com was a fast growing business that went from a start-up to $300 million in annual revenue in just a few years. Quidsi was able to create a strong company by using diapers as a means to attract customers and keep them coming back for more. But the company’s profitability came from the other items people bought alongside the diapers, such as formula and shampoo. That basic plan of encouraging repeat business and then upselling their customers is what attracted Amazon to Quidsi in the first place. With its own brand of diapers, Amazon is probably looking to do something similar where Prime members come for the diapers but stay for the tablets and HDTVs—while also cutting out the middle men in the diaper business itself, lessening the financial blow of selling diapers at loss-leader prices. Part of the company’s strategy with Prime is also to keep layering on benefits for paying that $99 yearly membership fee. The privilege to purchase Elements products joins other Prime perks such as "free" movie and TV episode streaming, the Kindle lending library, unlimited photo storage, and free two-day shipping. Finally, let’s not forget the boutique appeal of revealing product sourcing, ingredient listings, and other information. That kind of data will give Elements a strong appeal to a large swathe of moms and dads. Sit around long enough with a group of parents, and you’ll soon hear all about the merits of BPA-free plastic bottles versus stainless steel, the best place to get anti-biotic free chicken and organic eggs, and why little Suzy is now gluten-free. You can bet that legions of parents are already perusing Amazon’s site to find out where the elasticized cuffs and inks on Elements diapers come from. Amazon’s goal, then, isn’t necessarily just about offering the cheapest diapers possible. Instead, the company will use information-laden Elements products as a way to gain more Prime customers who will very likely buy more stuff alongside that bulk pack of size three diapers every month.